He first sprang into my consciousness two weeks ago, early one Sunday morning, when I was down among the fly-pitchers in the Bethnal Green Rd. As if out of nowhere, he appeared from behind a telephone box with his guitar in hand declaring, “I am Jason John, I’m writing you a damn good song.” With charisma and intensity, he drew the attention of everyone within earshot and the pavement became his stage as he launched into one of his own compositions, opening his heart and channelling his emotions into a soulful ballad. Even at first sight, Jason John made an unforgettable impression. 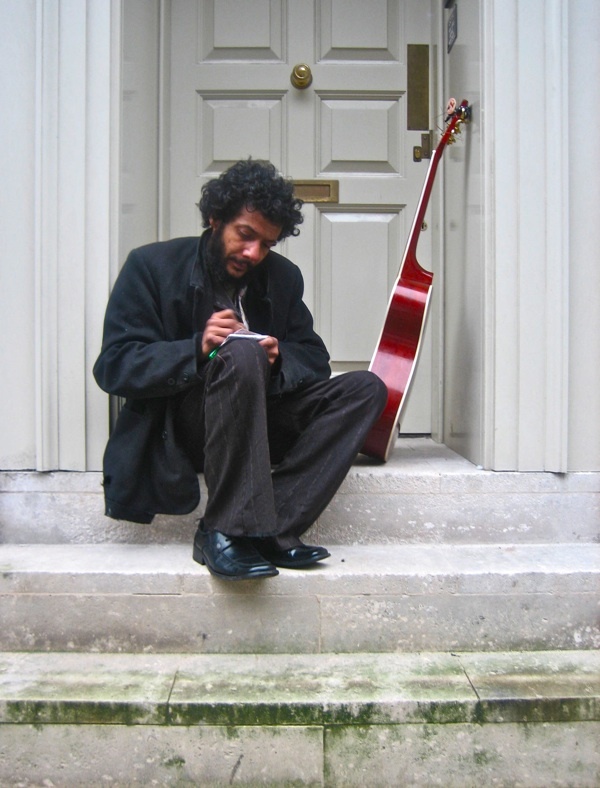 And then yesterday, I came upon him sitting with his guitar in a doorway in Folgate St, sheltering from the drizzle on the first chilly day of the Winter, and – once we had re-established our acquaintance – we decided to take refuge in the barroom of the Water Poet where Jason spoke to me of his life as a street musician. “I’m a West London lad. They know me around Shepherd’s Bush, Hammersmith and Acton because I grew up in Chiswick. 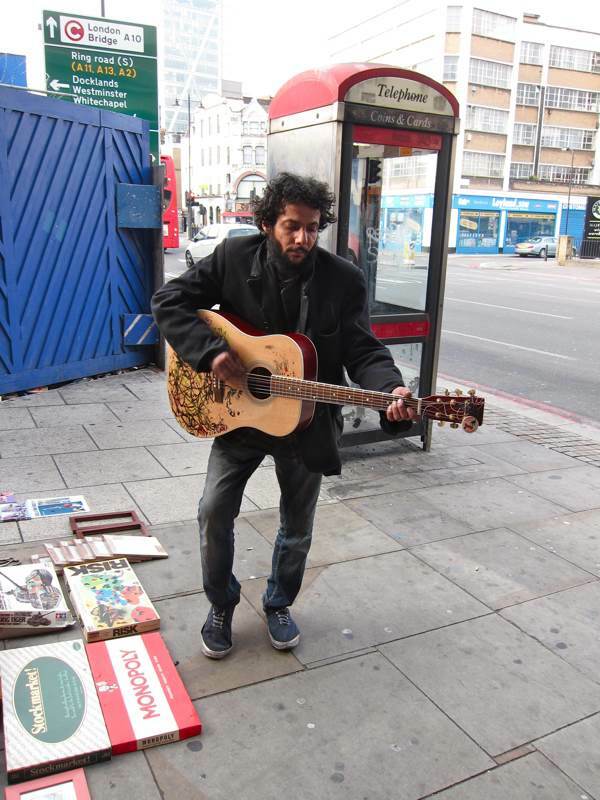 I’ve played in Notting Hill and all over the West End, so I thought I’d travel to the East and get myself known here. 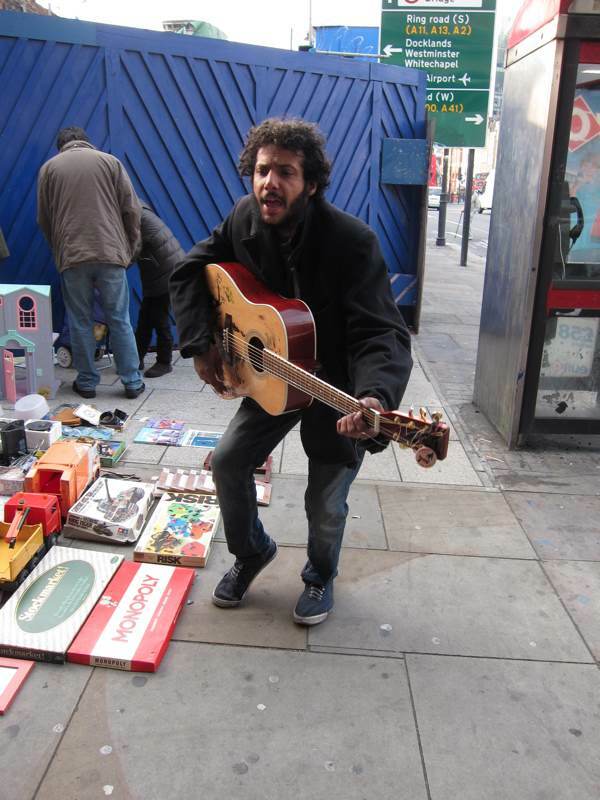 Sometimes I play in Leadenhall Market, Hoxton Square and at Liverpool St. I write my own songs. I’ve always written, stories, poems and songs. I grew up playing the guitar and I can play bass, violin and piano. Being a musician, singing and playing, it’s like being a storyteller. My first real involvement with the music scene was as roadie for the Bluetones. I knew them from school, and I stayed at their house and slept on the couch. It was a non-stop party and there were always girls. My first proper taste of the music industry – you got paid and there was always food and drink. When they took off, I didn’t feel bad but I did wonder, “How could you just make it and leave us all behind?” Then Montrose Avenue came along and replaced the Bluetones, and they pulled more girls. My job went from being a roadie to becoming their minder, making sure they didn’t drink too much and keeping an eye on the girls too. At smaller venues, I’d get ten to fifteen minutes to play my own songs. I played in Camden once, thirty-six people were cheering me and saying, “That was a good one,” I gave out my phone number and email many times that night. When I played the Hub at the Metropolitan University, there were rows of girls in front and they loved me – but I was frightened when they all shouted at once, I thought they were going to grab me. My girlfriend dropped me at that time – over my music – she said, “You can’t do any other job, and trying to live by playing and singing, it’s impossible.” When Montrose Avenue made it, I thought, “It’s not going to happen to me, this is the second time.” So I took off to France for a year, going down South and playing on the road, then I went to Amsterdam and lived there for a year. I love playing and singing, that’s why I’ve dedicated my life to it. Two years ago, I was sitting playing in Allen Gardens when I found myself. I started to cry. I could literally see myself. Since that Summer, I’ve had a hunger to play to people. If I see a crowd of people, I want to win their spirit. It fills me with goodwill. When you are going around playing and singing you’ve got to feed your soul. I have a smoke and it gives me a nice merry feeling. In your head you behave like a giant. Sometimes the crowds roar and cheer for me. I walk down the street and people are hugging me. I’m living in Earls Court at the moment in a hotel, it’s forty pounds a night. 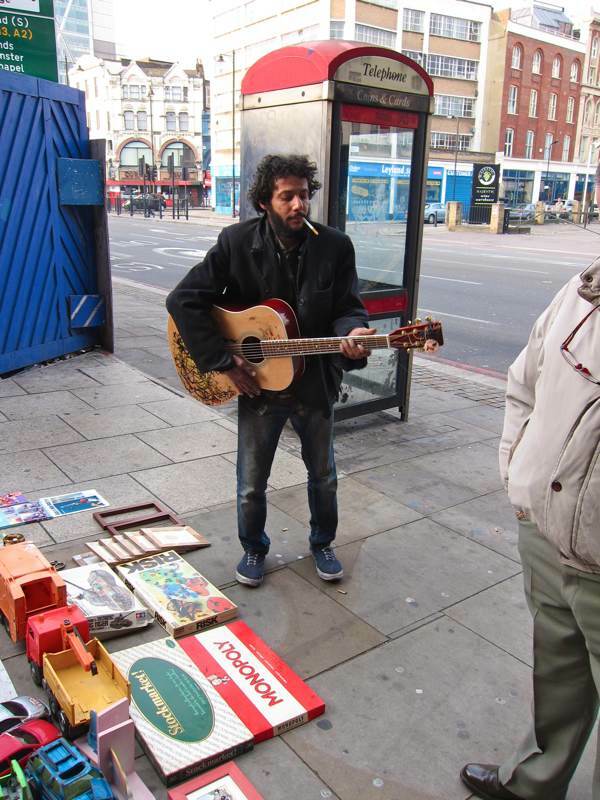 I have to make that money each day playing on the street. You can’t give in. It’s all up to you. You’ve got to put your feeling into it, heart and soul – because how you feel, that’s how the listener’s going to feel. You got to feel emotion, I’ve played and cried in front of people, and they’ve cried too. When I expressed my concern over this immediate circumstance, Jason shrugged it off – self-reliant and philosophical, and taking one day at a time. A man of innate dignity and possessing a sympathetic nature, he impressed me with his single-minded pursuit of songwriting, risking himself and sacrificing conventional ambition for the sake of a purist desire to communicate through music. 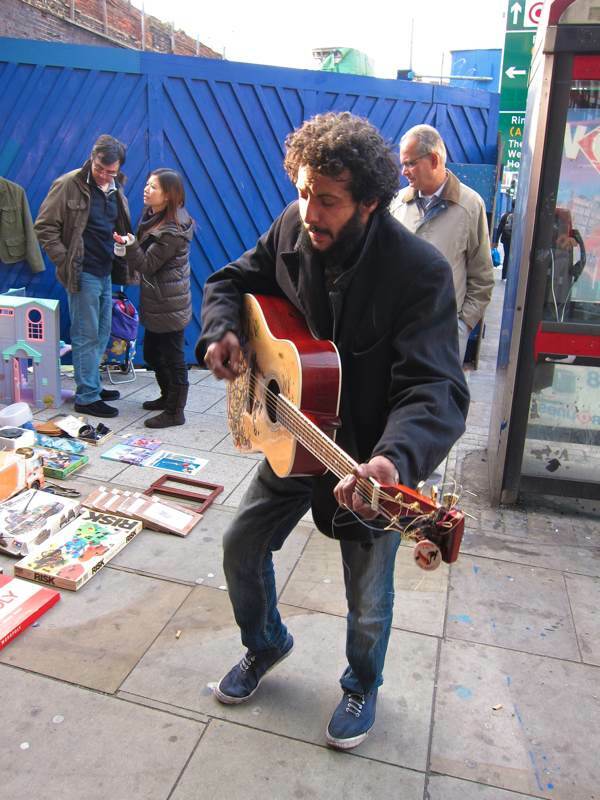 The street is an unforgiving arena for a performer yet Jason has embraced busking with consistent success and made himself at home on the pavement, creating a distinctive persona that is his alone. “I’ve always liked pin-striped flares and leather jackets, and I always wear shoes. I try to keep them as shiny as I can. If you dress smart with shoes and trousers, you can get in anywhere – but not with jeans and trainers.” he informed me authoritatively, when I complimented him on his style, layered up with old coats and silk scarves. Wonderful post – here’s someone whose life seems from the outside to be precarious in the extreme, and who is yet probably happier than most of us. By coincidence I’m reading WH Davies’ ‘Autobiography of a Super-tramp’ – Davies, a poet and wandering man of the late C19 and early C20, had a similar spirit to this musician. Another wonderful post – how lovely that this talented and charming man is still entertaining people with his music. 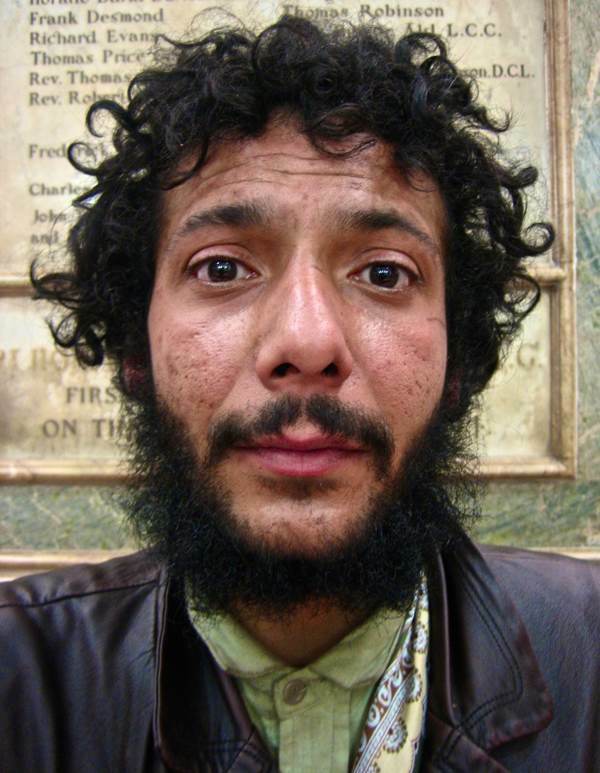 I shall keep an eye out for him when I walk around the market. Thanks very much for such a warm and well observed portrait, Gentle Author. Beautifully written piece about a beautiful person. I will keep an ear out for this intriguing person. A lovely post about a subject that touches us all as we walk about our daily lives. Does he pay any tax and how expensive £40 pr night hotel bills.